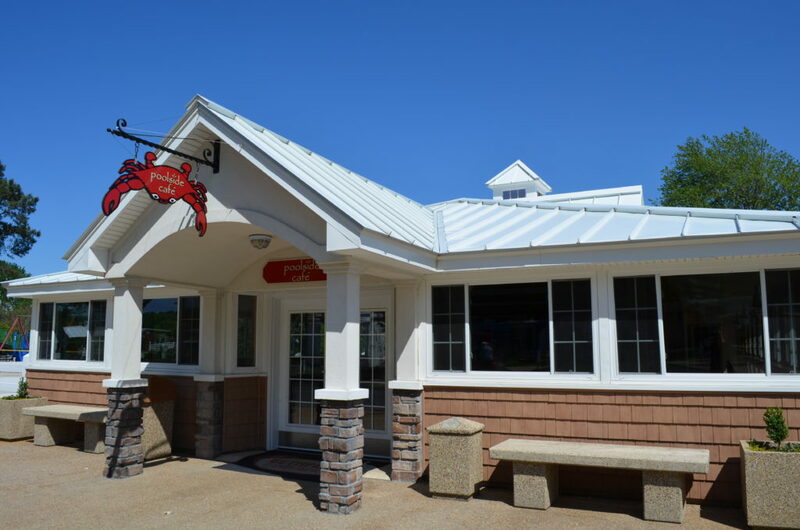 The restaurant at Bethpage Camp-Resort features a delicious variety of breakfast items, sandwiches, fresh seafood, artisan pizzas, sides, desserts and beverages. The restaurant is located next to the water park and offers guests indoor seating or outdoor water park seating. At breakfast try one of our eye openers like breakfast biscuits, pancakes, French toast or breakfast pizza. At lunch and dinner try the Crab Cake Sandwich, Cheeseburger, Pulled Pork BBQ or Oyster Po’ Boy! For the kids we have chicken tenders, macaroni and cheese, cheeseburgers and personal pizzas! The whole family will love our selection of hand-crafted artisan pizzas from Crab Alfredo and BBQ Chicken to Margherita and Meat Lovers. While you’re at the River seafood is a must! Try our Chesapeake Bay Steamers with shrimp, clams, snow crab clusters and platters. Finish off your Poolside Café meal with one of our desserts of the day, brownies or a chocolate eclair cake! Our venue offers professional catering on-site, at local venues or in your own home. We can create a dining experience your guests won’t soon forget! Our professional team offers a variety of menu offerings and can customize menus to fit your theme and your budget. Contact our special event manager for more information.